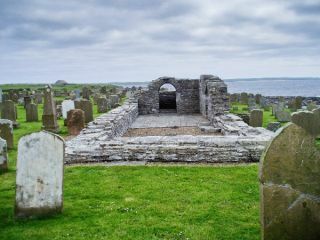 Westside Church is a roofless 12th-century Romanesque church, one of best preserved medieval churches of Orkney. It was built by an unknown Norse chief, whose farm lies atop the nearby cliffs. The building is simple, consisting of only a nave and chancel. For many years it served as the parish church. Some time in the middle of the 12th century a Norse chieftain built this simple rectangular building in a clifftop location. It is alternately known as Holy Cross Chapel and as Cross Kirk. The church was enlarged - probably in the 13th century, though the style of the doorway suggests a 16th or 17th-century date, possibly when the building was used as a parish church. Near the church is a Viking settlement attributed to Hafliki Thorkelsson. The settlement appears to date to the same period as the church, so it is possible that Hafliki Thorkelsson also built the church. The church is oriented on an east/west axis. The original building was made of 2 rectangles; a nave and chancel. The nave was extended at the western end, probably in the 13th century, but the original south doorway was preserved. Near the doorway are a round-headed window and a recess in the wall. The chancel arch is also round-headed, typical of the 12th-century Romanesque style, and the chancel was barrel-vaulted, though it now stands roofless to the skies. The original 12th-century walls stand some 2.5 metres high, but the later nave extension is only distinguished by foundation walls. There is a small graveyard outside the church, and a seawall protects the entire Tuquoy site. Archaeologists discovered a stone carved with Viking ruins during excavation work on the site. Nearby accommodation is calculated 'as the crow flies' from Westside Church, Tuquoy. 'Nearest' may involve a long drive up and down glens or, if you are near the coast, may include a ferry ride! Please check the property map to make sure the location is right for you.